Benjamin Franklin was born in Milk Street, Boston, on January 6, 1706. His father, Josiah Franklin, was a tallow chandler who married twice, and of his seventeen children Benjamin was the youngest son. His schooling ended at ten, and at twelve he was bound apprentice to his brother James, a printer, who published the "New England Courant." To this journal he became a contributor, and later was for a time its nominal editor. But the brothers quarreled, and Benjamin ran away, going first to New York, and thence to Philadelphia, where he arrived in October, 1723. He soon obtained work as a printer, but after a few months he was induced by Governor Keith to go to London, where, finding Keith's promises empty, he again worked as a compositor till he was brought back to Philadelphia by a merchant named Denman, who gave him a position in his business. On Denman's death he returned to his former trade, and shortly set up a printing house of his own from which he published "The Pennsylvania Gazette," to which he contributed many essays, and which he made a medium for agitating a variety of local reforms. In 1732 he began to issue his famous "Poor Richard's Almanac" for the enrichment of which he borrowed or composed those pithy utterances of worldly wisdom which are the basis of a large part of his popular reputation. In 1758, the year in which he ceased writing for the Almanac, he printed in it "Father Abraham's Sermon," now regarded as the most famous piece of literature produced in Colonial America. Meantime Franklin was concerning himself more and more with public affairs. He set forth a scheme for an Academy, which was taken up later and finally developed into the University of Pennsylvania; and he founded an "American Philosophical Society" for the purpose of enabling scientific men to communicate their discoveries to one another. He himself had already begun his electrical researches, which, with other scientific inquiries, he carried on in the intervals of money-making and politics to the end of his life. In 1748 he sold his business in order to get leisure for study, having now acquired comparative wealth; and in a few years he had made discoveries that gave him a reputation with the learned throughout Europe. In 4 politics he proved very able both as an administrator and as a controversialist; but his record as an office-holder is stained by the use he made of his position to advance his relatives. His most notable service in home politics was his reform of the postal system; but his fame as a statesman rests chiefly on his services in connection with the relations of the Colonies with Great Britain, and later with France. In 1757 he was sent to England to protest against the influence of the Penns in the government of the colony, and for five years he remained there, striving to enlighten the people and the ministry of England as to Colonial conditions. On his return to America he played an honorable part in the Paxton affair, through which he lost his seat in the Assembly; but in 1764 he was again despatched to England as agent for the colony, this time to petition the King to resume the government from the hands of the proprietors. In London he actively opposed the proposed Stamp Act, but lost the credit for this and much of his popularity through his securing for a friend the office of stamp agent in America. Even his effective work in helping to obtain the repeal of the act left him still a suspect; but he continued his efforts to present the case for the Colonies as the troubles thickened toward the crisis of the Revolution. In 1767 he crossed to France, where he was received with honor; but before his return home in 1775 he lost his position as postmaster through his share in divulging to Massachusetts the famous letter of Hutchinson and Oliver. On his arrival in Philadelphia he was chosen a member of the Continental Congress, and in 1777 he was despatched to France as commissioner for the United States. 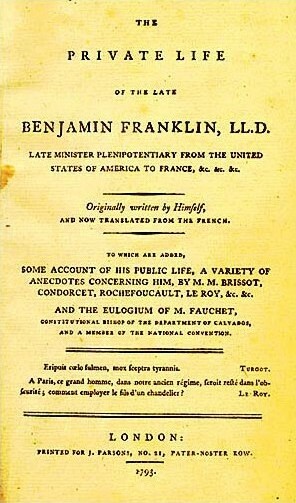 Here he remained till 1785, the favorite of French society; and with such success did he conduct the affairs of his country that when he finally returned he received a place only second to that of Washington as the champion of American independence. He died on April 17, 1790. The first five chapters of the Autobiography were composed in England in 1771, continued in 1784-5, and again in 1788, at which date he brought it down to 1757. After a most extraordinary series of adventures, the original form of the manuscript was finally printed by Mr. John Bigelow, and is here reproduced in recognition of its value as a picture of one of the most notable personalities of Colonial times, and of its acknowledged rank as one of the great autobiographies of the world. Return to the Benjamin Franklin library.